Since Rob Behrens became the Ombudsman in April 2017 he has been at great lengths to stress the importance of ‘impartiality’. In his pre-appointment hearing with PACAC (18.1.17) he confirmed that ‘impartiality’ was central to the role of the Ombudsman. What evidence is there that the Ombudsman is not impartial? There is the fact that PHSO is Parliament’s Ombudsman, set up by legislation agreed in the House as a body to hold government departments, Ministers, MPs and civil servants to account. An inherent conflict of interests from the beginning. The Parliamentary Commissioner (PCA) later known as the Ombudsman was set up as an officer of Parliament designed to assist MPs in holding the executive to account via public complaint. This report from Paul Burgess 1983 found that the Ombudsman did all in his power to accommodate the body under scrutiny, whilst ignoring the complainant and confirmed that a lack of external scrutiny had allowed the Ombudsman to be taken into the ‘bosom of the establishment’. Not an easy place to be if you are claiming to be impartial. More recently the Patients Association (PA) wrote a number of damning reports about the work of the Ombudsman. In 2015 (following the publication of a previous report) over 200 people contacted PA to state their dissatisfaction with the Ombudsman service. The PA collated their responses in a report entitled Labyrinth of Bureaucracy where 66% stated that the final Ombudsman report was factually incorrect, inconsistent or substandard and 62% said that the Ombudsman overlooked evidence which contradicted the NHS Trust apparently siding with the Trust. Lack of impartiality was a repeated complaint. This discrepancy is in keeping with a very low uphold rate. In 2017/18 only 2.6% of accepted formal complaints were upheld in full and only 12.2% were given partial uphold. The vast majority of people who complain to the Ombudsman go away with nothing. Consumer feedback data is used by PHSO to demonstrate to PACAC the level of public confidence and satisfaction in the service. If the Ombudsman acted without impartiality then this should be highlighted in low consumer scores. In July 2016 PHSO changed their method for gathering consumer data and now compare external complainant feedback with an internal score generated by the Ombudsman as part of their Service Charter. They seek the complainants’ feedback on all key areas apart from Q10 which relates to the impartiality of the service. This omission has been criticised in the PACAC Annual Scrutiny Report 2016/17. If the number of review requests is taken into account (as given above) it can been seen that for every dissatisfied body in jurisdiction there are 100 dissatisfied complainants so it would appear to be something of a glib response from Amanda Campbell CEO given the importance of impartiality to the very DNA of the Ombudsman service. As public confidence relied upon the fact that the Ombudsman was seen to be impartial, PACAC requested that PHSO asked this question of complainants and published it as part of their service charter in the future. Although PHSO agreed to find a way forward on this by 2017/18 they were still not publishing on the specific question which dealt with impartiality. Consequently, Dr Rupa Huq a member of PACAC asked the following question in January 2019. She was given a waffly response from Amanda Cambell CEO which suggested that securing this information was difficult but all they need to do is put Q10 of the Service Charter to the public as it is stated; We will evaluate the information we’ve gathered and make an impartial decision on your complaint. Why is PHSO so reluctant to put their ‘impartiality’ to the test? Customer satisfaction data should act as a barometer of performance giving valuable feedback to both PHSO and PACAC. It is however, difficult to have any confidence in this data when the percentage scores fail to reflect the external criticism of this organisation. It has now been widely accepted that between 2012 and 2016, under the stewardship of Dame Julie Mellor, the Ombudsman service had ‘lost its way’. Yet the satisfaction scores under Dame Julie Mellor’s were higher than they are now under Mr Behrens leadership. Why didn’t these ‘independently gathered’ scores reflect the levels of dissatisfaction cited by the Patients Association, reported to PACAC by the public in numerous written accounts and now acknowledge by PHSO themselves? In 2017 Martin Lewis and Money Saving Expert (MSE) carried out an independent survey of Ombudsman services. Approximately 100 people responded regarding PHSO and 82% said their experience was poor (p 54) with 75% saying they felt that PHSO was biased in favour of the other party (p 59) MSE-2017 These ‘independently gathered’ low-score figures are also replicated on other free-access consumer forums such as Google reviews and Trustpilot. Why is there such a disparity in scores? If the PHSO customer satisfaction scores are an indicator of public confidence they are an unreliable one but as no other indicator exists, these are the scores which are repeatedly used to demonstrate approval. It can be seen that there has been no real movement over time but a rather static stodge of data. Most recently Sir Liam Donaldson used these scores to determine that there was a level of customer satisfaction in the Ombudsman service. It would appear that he was not availed of this view from any other sources. Unusually, he had been able to take a peek behind the curtain of the secretive PHSO investigation process. Following an upheld judicial review against PHSO, Sir Liam was recruited as an independent expert to review the way PHSO used clinical advice in determining the outcome of investigations. His Clinical Advice Review was completed in December 2018 but not released until March 2019, after the annual PACAC scrutiny session which was held in January. Referring to the court judgement, Sir Liam cites the fact that the ‘internal’ world of PHSO where caseworkers remained convinced of the validity of their actions, clashed with the ‘external’ world where those actions were held to be perverse and illogical to the point of illegality. This goes to the very heart of ‘self-regulation’ and warns that PHSO should not be able to continually monitor its own performance without some form of external scrutiny. With direct access to caseworkers, clinical advisors and complainants Sir Liam had a rare opportunity to examine the whole investigation process. Although measured, his report reveals a system which is rife with opportunities for bias from the pre-determination of lay caseworkers who sift clinical evidence to present their preferred account, to the failure to provide all the evidence to the clinical advisors or allow them to give valuable input which goes beyond the narrow question base procedure and emphasised the failure to involve the complainant, often a key witness, until the process was complete. With access to written transcripts, case studies, investigation reports and the attendance at a ’round table’ focus group meeting with twelve complainants, Sir Liam reported that the complainants told a consistent story and one which needs to be heard. Reading Sir Liam’s Clinical Advice Review it is obvious that there is no ‘clear and accessible policy framework’ and certainly not one which protects the public. There is also a great deal of evidence, as cited above, that the Ombudsman is not impartial, hence the dissatisfied users joining together. 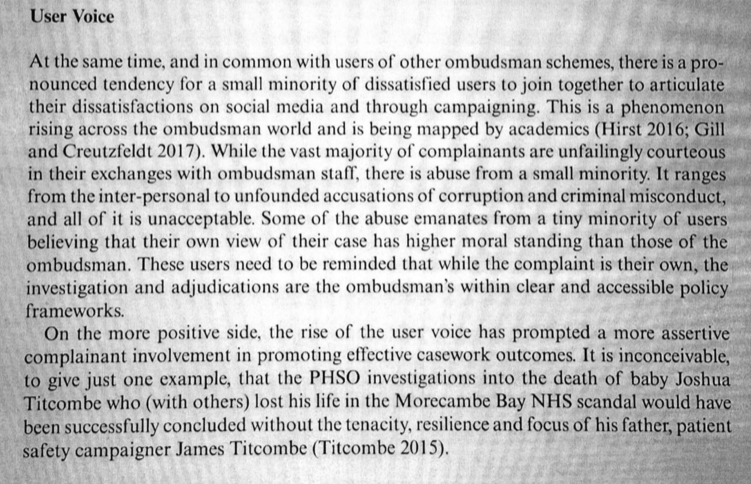 The fact that James Titcombe had to fight PHSO with ‘tenacity and resilience’ speaks volumes about the service he received. But let us ponder upon the full meaning of this statement for a moment and consider just who is claiming ownership of the ‘higher moral standing’ here. Previous Previous post: Whose side is the Ombudsman on? Next Next post: Why campaigners need academics – part one. You are right Norman. Rob Behrens can only serve one master and it is clear he doesn’t beleve he is there to serve the public. Excellent article, ‘facts’ should not be ignored. Rob Behrens has been in post now for nearly two years. As yet no proof that he is not all words and no positive action. Unless something happens soon have to draw the conclusion the whole set up is a total sham. Terrible waste of public money, with no accountability for supposedly public servants. We the public are being taken for an expensive ride. Rob Behrens is on £192,000 to do what exactly? What is Amanda Campbell’s wage? How much money is being spent on blocking a Victim’s basic Civil Right to justice? How many Academics across the UK are being employed to write misleading reports and collude in the propaganda that things are “going well” with the Ombudsman? Della has volunteered her time into trying to understand why the Ombudsman is a “chocolate teapot”. Who’s Facts are reliable and trustworthy? The data provided by Della, a Volunteer, who has worked tirelessly for others or someone employed by the Ombudsman to tow the line? Thank god for yours and Della’s voluntary work. Money is a key issue Fiona. Money funds research. Academics may wish to explore other issues with the Ombudsman but who funds the project? We have establsihed that the so-called investigation service (PHSO and the rest) are specifically appearance-based to perpetuate a general illusion that there is some regulatory powers in place, which there are for the government’s spin machine of which RB is the latest mouthpiece of deflection. Our pressure group and other concerns continue to publicly flag up the illusion with the truth towards reversal. Substantiated truth Peggy not spin. What I have come to learn since I got involved with the complaint handling system, from 2011 onward, is that no amount of common sense or indeed evidence is ever taken into consideration by the PHSO. The hierarchy within the NHS is shaming the hard work nurses and doctors do in increasingly difficult times. The cover up starts at the very top of the NHS and is carried forward to the bogus Health Ombudsman where the level of corruption is so breath taking that it leaves victims of poor health care service even more vulnerable than before. (And after the life changing events we suffer that’s no mean feat, which proves beyond a shadow of doubt this corruption is absolutely deliberate). Value for money is mandatory at audit of public service. When will taxpayers have confidence that its public servants comply with this mandate? will PHSO ever present some evidence of ANY VfM? Its track record suggest PHSO will never be of any value to the taxpayer. Why is it still in existence? How can the NHS improve with PHSO blocking all evidence? The NHS doesn’t improve. Sir Liam made that clear in the start of his report. We are paying to be closed down. It seems from this latest report, that Mr. Behrens is even more arrogant and evasive than his predecessors . Another great blog! If Rob Behrens feels he has a “higher moral standing” than the rest of us then why would he sit on a critical report for 3 months while the PACAC scrutiny was ongoing and then very quietly publish it without any notification? Doesn’t seem to me like the behaviour of someone with “higher moral standing”. Behrens almost vicious attack in his “user voice” section speaks volumes. People have valid concerns and the fact that he doesn’t address them, but instead uses well-worn tactics to attempt to discredit people, tells us everything we need to know. Even the words “These users need to be reminded…” are laden with the disdainful arrogance that so many of us have experienced at the hands of the PHSO. And as for suggesting that “the complaint is their own”, that’s exactly the issue. Once the PHSO has distorted a complaint, stripped it out, and been wilfully selective in what is investigated, it is no longer the complaint the user recognises as their own. Yes, as EJ comments in the last paragraph, the “almost vicious attack” from Mr Behrens speaks volumes and tells us everything we need to know. Arrogance verging on divinity possible because Mr Behrens knows there is no mechanism to hold him to account. A complete sham. I waited 15 months for the final report – full of errors, evidence ignored, apart from a single medical expert report that was also full of errors, no other witnesses even spoke to. I asked for a review with dozen of pages of factual evidence, highlighted medical notes, four signed witness statements, all ignored. Unbelievably useless organization. Useless by design Dennis. Has been for years. Dennis, everything you say mirrors my experience, many others too. We all have been through this ‘managed process’, and I use the term managed in it’s most sinister of forms.